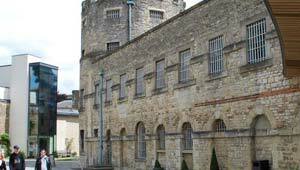 Oxford Castle Unlocked is a visitor attraction based inside the old Oxford Castle which was a prison up until the mid 1990s. There are three main areas that you get to see on the guided tours. The first is the oldest part of the building, St George’s Tower, which stands tall above the rest of the complex. The second is the spooky crypt under the chapel which used to stand on the site and the third is the former prison cells, some of which have been laid out like they would have been in years gone by. The tour is brought to life by your costumed guide who plays a role from the prison’s past – our guide was a former governor called Solomon who played his part with relish! To be honest, without the ‘performance’ of the guide, the attraction would be a brief one to visit, but the stories that the guide tells really help to bring the place alive. You really get a taste for what prison life must have been like many years ago. We also enjoyed the view from the top of St George’s Tower. The stairway is a tough climb, but when you get to the top, there are two levels. Firstly, the level of the roof itself, where you can peep through the battlements and secondly, a special viewing platform has been constructed so you get an unobstructed view of the city. Oxford Castle Unlocked is open daily from 10am with the last tour at 4.20pm. Adult admission is £9.25 (2013 prices) with discounts for children, families, students and seniors. When we visited, tours were running every 15 minutes. When you visit Oxford Castle Unlocked, spend a bit of time looking around the rest of the Castle complex. There’s a swanky Malmaison Hotel and several bars and restaurants inside the old buildings there. It’s a nice place for a meal out and if you ask in the hotel, they usually let you have a quick look at the main area inside where the bedrooms are former prison cells. Oxford Castle Unlocked is part of the complex of businesses, food outlets and a hotel which occupy the former Oxford Castle site. It is located near the Westgate Shopping Mall in the centre of Oxford.